What is the difference between a rethermalizer and a food warmer? A food warmer keeps and holds already cooked foods hot at a food safe temperature above the HACCP “danger zone” of 140°F (60°C). The food must be heated first to the safe serving temperature and then transferred to the warmer for holding and serving. The food warmer will hold the hot foods at a consistent safe serving temperature above 140°F. A rethermalizer (food cooker/warmer) will heat precooked foods from a chilled or frozen state (below 40°F, 4.4°C) to above 140°F, in approximately 90 minutes. It can then hold the heated food at a serving temperature above 140°F, until ready to serve. It is not necessary to pre-heat the food product prior to placing it into the rethermalizer. Cooker/warmers require a higher wattage which is necessary to cook the food and typically will cost more than a food warmer. What type of products can be held in a food warmer? The most popular foods in a buffet line or shelf serve area such as meats, soups, pastas, gravies, sauces and vegetables can be held and served with a Countertop Food Warmer. Do I need any accessories with the Countertop Warmers? Most food warmers are sold without the food pans, so always check when ordering a food warmer. The Vianni Countertop Food Warmer is sold without insert pans. It will accept all 12” x 20” full and fractional sizes. What size pans should be ordered for a countertop food warmer? 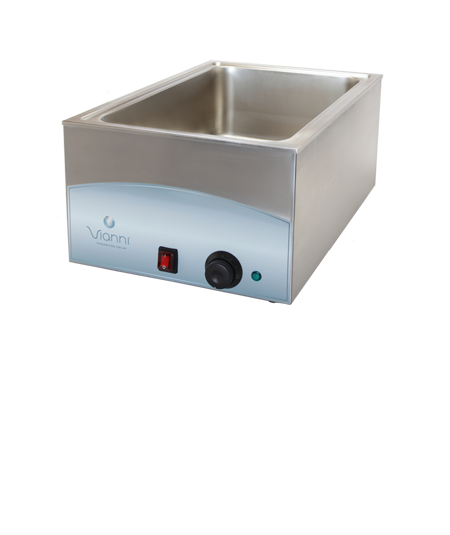 The 12”x 20” rectangular food warmers use standard stainless steel steam table/ hotel pans. These pans are available in a variety of sizes including; 1/6, 1/4, 1/3, half, 2/3 and full. Adapter bars are available to hold the pans in place. What does it mean for a countertop warmer to operate “Wet or Dry”? Countertop food warmers are designed to operate “wet” or “dry”. Countertop warmers that operate with water are considered (wet) and are the best option. The use of water maximizes the heat transfer from the heating elements to the food product. The steam from the water essentially keeps the food hot and provides an even temperature distribution and less hot spots for the food. The Vianni Countertop Food Warmer operates with water (wet) only. Some warmers are designed to operate with water (best option) or without water “dry” (will not harm warmer). What is the best way to keep hot food at the desired temperature? The best way to maintain food at the desired hot temperature while holding food in a countertop warmer is to use a cover with the inset, maintain the correct water level in the well, and frequently stir the product. The moist heat will keep the food temperature steady, but will not raise the serving temperature.